The legend tells us of Sacagawea ("Bird Woman") as the guide showing Lewis and Clark the way over the Rockies to the Pacific Ocean, and fictionalized accounts have embroidered on her life as it might have been. In fact, however, her life as it might have been. In fact, however, the young Indian woman who accompanied the expedition did not serve as a guide--though her presence with her child probably ensured the expedition's safety by signifying to the tribes whose territories were crossed that it was not a raiding or war party. This carefully researched historical account separates the verifiable facts about Sacagawea from the extensive legend. It provides a readable, credible account of Sacagawea coping with the incredible hazards of the journey, caring fo her child, dealing with her half-breed husband, and aiding the expedition with her survival knowledge, pluck, and constancy. 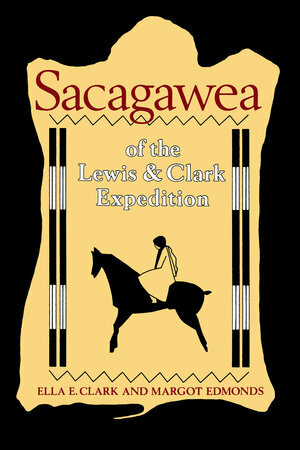 The authors have unearthed new documentary evidence which enables them to trace Sacagawea's later life until her death, and to locate her burial spot. They also tell how the Sacagawea legend was deliberately created, and show how it became so widely accepted. Nontheless, this is not a "debunking" study. Sacagawea, seen in the light of accurate history rather than legend, remains an intriguing and inspiring figure in our past. Ella E. Clark is Professor Emeritus of English, Washington State University. She is the author of Indian Legends of the Pacific Northwest, of Indian Legends from the Northern Rockies, and of numerous articles in Western Folklore and other journals. Margot Edmonds is a writer and editor. 11. A Legend Begins: Sacagawea Becomes "the Guide"